This paper presents a unified model for two complementary approaches of code reuse: Traits and Delta-Oriented Programming (DOP). Traits are used to modularly construct classes, while DOP is a modular approach to construct Software Product Lines. 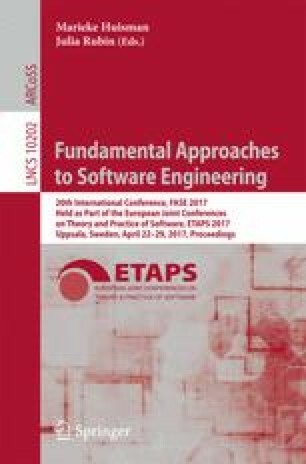 In this paper, we identify the common structure of these two approaches, present a core calculus that combine Traits and DOP in a unified framework, provide an implementation for the ABS modelling language, and illustrate its application in an industrial modeling scenario. This work has been partially supported by: EU Horizon 2020 project HyVar (www.hyvar-project.eu), GA No. 644298; ICT COST Action IC1402 ARVI (www.cost-arvi.eu); Ateneo/CSP D16D15000360005 project RunVar (runvar-project.di.unito.it); project FormbaR (formbar.raillab.de), Innovationsallianz TU Darmstadt–Deutsche Bahn Netz AG. We thank the anonymous reviewers for comments and suggestions for improving the presentation.